A continuous low humming hung over Chancellor’s Place. Quarter to eight. My stomach was making the raspy breathing sounds of a dying puppy. Having completed a massive two-and-a-half-hour Research Techniques seminar, I was hoping to celebrate my first ever UQ lecture with dinner for one. What I got instead was this little nugget: there wasn’t much in the way of tasty grub on campus for postgrads finishing at the 7:30 pm mark. A spike in excitement and shuffling feet signalled the arrival of the City Buz. Hopping into the 412 bound for Toowong, I wondered if my research question, which I was going to be stuck with all semester, absolutely had to be food related. ‘You can ask yourself that again,’ my stomach acids shot back. Tuesdays were worse; Corrie MacDonald’s WRIT7030 lectures brought on reveries of crunchy, golden fries even as a sustained hiss from cracking open the imaginary bottle of Coke drowned out Gustave Flaubert and Co. I might have spent the rest of the lecture on Le mot juste drafting up a petition to ‘Bring Maccas to UQ’ but to my credit, it was a pretty persuasive document. ‘How can someone be so hungry?’ you ask. Should I point you to the blast-chiller levels of icy winds in some of the lecture theatres, dear reader? Or perhaps to the cold, dead eyes of the tutors when they hand back our assessments? Sometimes, the sunny memory of a hot, buttery raisin-toast devoured with satisfaction at Lakeside Cafe is the only comfort. To your cries of ‘Just eat before the lecture!’ I say: we, Hobbits of the Shire, eat and drink, often and heartily. Wednesdays’ Publishing lectures were kind to my easily aroused munchies; because walking through the eerie corridors of the Hartly-Teakle building, with its abandoned war hospital slash nuclear exclusion zone vibe, meant that one was left with no will to live anymore; never mind that second dinner. I would go straight from uni to my grave Graceville home. On Thursdays, the hunger pangs returned in Writing the Story with one look at my lecturer’s red, Boston University mug sitting at the desk, steam rising gently from its lips while the rest of the class stumbled slowly in. I would imagine it to be full of thick, hot chocolate topped with marshmallow cats on some evenings, and spicy lentil soup on others. Don’t get me wrong­, there was always the Pizza Caffe—and the Pizza Caffe serves up delicious fare, as I’ve found out much later—but back then I hadn’t even made enough friends to finish one full pizza. And the last thing I wanted, was to take that pizza ‘to go’, on the bus, full of hungry tummies just like mine. When second semester came, it was like someone hit the reset button. Why else would a recipe involving cheese and bacon from a not-so-stray slide accost my senses in the middle of a lecture on rhetoric? But this time, I was armed. 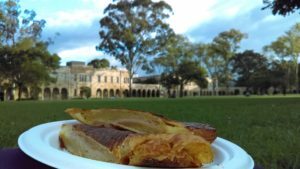 In the break between semesters, I had planned and executed a thorough reconnaissance of cafes and eateries across UQ—complete with footnotes on business hours, best-buys, and a list of emergency eats. Reassured by the Darwin’s chocolate muffin, roughly the size of my head, waiting to be eaten after class, I was actually able to focus on Academic & Corporate Editing. Writing About the Arts was great—till we hit food-writing week. Amid discussions of cooking experiments, restaurant reviews and food-memories, something growled like a chained beast under my shirt. A friend slipped a protein ball into my hands; it was from the most famous smoothie bar on campus. As a bright halo of light formed over her mop of dark hair, I sheepishly scribbled ‘Boost Juice’ under my list. Editing the Manuscript was all about fixing deliberately badly written fiction, and fiercely contesting editorial disagreements, when one day I caught sight of that red, Boston University mug again. Only this time, I was able to smile at it and tell myself that it was just tea. The goodies from the Lolly Shop were eaten with much satisfaction on the walk to the bus stop that evening. I was defeating hunger-pangs, one great UQ snack at a time. Of course I did! I was struggling with it subconsciously for some time now. It was most likely a UQ club was holding a sausage sizzle right behind our lecture room in the Frank White building. I guess I knew what I was having for dinner that evening! After class, I ran out to locate said sausage sizzle but there was no trace of it. None. Heartbroken, I marched straight for UQU’s 24/7 Student Space; didn’t think I would be referring to ’emergency eats’ that early in the semester, but I regret nothing. I extracted some change from my purse and waited for a packaged pasta to be dispensed. (I also vended some cookies, just in case.) While my dinner got warm in the microwave, I had a moment to reflect on things: The University of Queensland may have been many things to many students; but to this perpetually hungry daughter she has been, in the most literal sense of the word, her alma mater. If you muttered something about an eating disorder, let me adjust my monocle before saying ‘guts of steel’. What? Staying creative, and training for it, is hungry work, sheesh! Apeksha Rao migrated to Australia in 2016 from India. Besides food, storytelling is Apeksha’s other big love. She takes a keen interest in KidLit, cartooning, and slice-of-life anime. She will graduate with an MA (Writing Editing Publishing) in July 2017. This entry was posted in Campus sprawl, Life at UQ and tagged 2010s, cafes, campus food, First Day, foodie, Freshers, Great Court, Master of Arts, Overseas students, Postgraduate. Bookmark the permalink.